The Event Viewer is a great way to diagnose system problems in Windows. You can access the build in Event Viewer by clicking on Computer Management in the Administrative Tools section of the Control Panel. Events are sorted by type, date, source, event id and other variables. 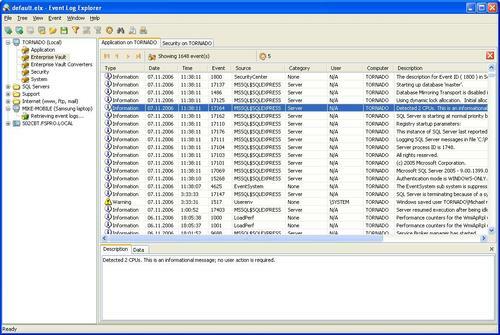 The main problem of the default Event Viewer is the lack of information and options to obtain them. A good way to start would be to look up the Event Id in a database that contains a list of them. This has to be done manually if you use the default Event Viewer. The software Event Log Explorer is a free for personal use software that adds more comfort and functions to working with the Event Log in Windows. It basically displays the same amount of information but offers ways to quickly lookup Event Ids on the Internet. A right-click on an Event Id will provide the user with the option to look it up in the Event Id database or Microsoft Knowledge Base. That's actually only one of the new functions that make the product a great replacement. The quick filtering function is another one. Whenever you right-click on a column you can quickly filter for that value, right-clicking on a date for example gives the option to filter events of that date. Another interesting addition is that the description of the event is available in a third pane that has been added. If you use the default Event Viewer you have to right-click the event and select Properties to get the description which gives more details about the event. The only limitation of the free version is that it does not allow you to connect to more than three computers. j/k link has been added.